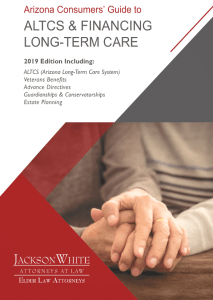 Receive your free 2019 ALTCS & Financing Long-Term Care Guide. Here, you’ll find a number of downloadable forms that are important to the long-term care process. Click the links below to download your forms. The Advance Directive Packet includes the proper forms for a Living Will, Health Care Power of Attorney, Mental Health Care Power of Attorney, and Financial Power of Attorney. These are the most common, basic forms of directives that are recommended to all individuals to have completed before a need may arise. These forms are Arizona specific and include instructions for completion. Individuals should fill out a DNR if they do not wish to be brought back to life in the event they stop breathing, or do not have the ability to decline assent. Resuscitation generally covered by this form refers to CPR, chest compressions, defibrillation, and artificial ventilation. Although anyone can potentially request a DNR form through their physician, this form is generally reserved for those to whom resuscitation would do It is important to have this form printed on orange paper and kept in an obvious place, should a friend or family member need to search for it in an emergency. The Financial Power of Attorney is a document that allows individuals (known as the “principal”) to forward their decision-making powers to someone else (known as the “agent”) for financial matters. This decision-making power is only brought about by the physical or mental incapacitation of the principal. As the title conveys, this form only governs financial decisions, such as purchasing and selling property, bank account managements, business decisions, etc. The purpose of the Health Care Power of Attorney is to select a person to make future healthcare decisions on your behalf. Thus, if you become too ill or cannot make those decisions for yourself the person you choose and trust can make those medical decisions for you. It is important to choose an agent that you trust and to convey your end of life wishes to them in advance, or include them in the form. Individuals that complete Health Care or Mental Health Care forms will need to notify their designated agent of their role. This is the standardized form provided by the state to fill out and send to any designated agent to make them aware of their responsibilities. A Living Will is a written expression of an individual’s desires, as to end of life decisions, created while they have the mental capacity to legally do so. The Living Will should outline the individual’s desired medical treatment should they need such measures. Note, if an individual would like to designate a specific person to make medical decisions not listed in their living will, they must do so by filling out the Health Care Power of Attorney. The Mental Health Care Power of Attorney designates an agent to make mental health care decisions for an individual, should they lose the ability to make these decisions themselves. Note, this is a separate power than those given under the Health Care Power of Attorney. This form applies strictly to mental health related decisions, e.g. choosing to institutionalize an individual. However, this power will only be invoked if one of the specific types of licensed medical professionals determine the individual is incompetent. To stay up-to-date on long-term care and financing in Arizona, sign up for our newsletter and stay in the know.